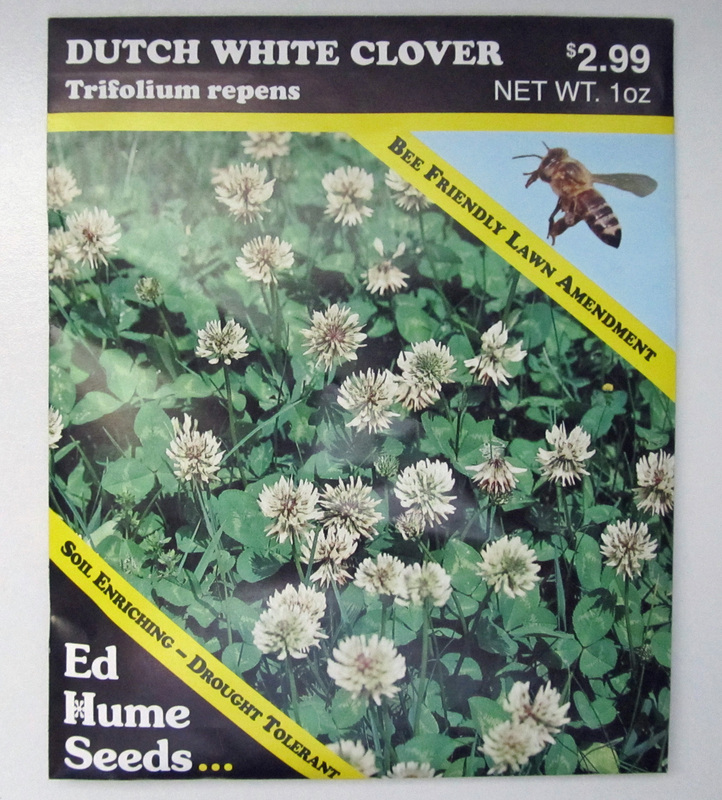 White clover is a low-growing, perennial plant that spreads vegetatively as well as by seed. It sends out horizontal shoots called stolons that form roots at various points along their length, creating a dense groundcover. Its compound leaves are made up of three, oval leaflets, and its flower heads are globe-shaped and composed of up to 100 white to (sometimes) pink florets. Rich in nectar, the flowers of white clover draw in throngs of bees which assist in pollination. 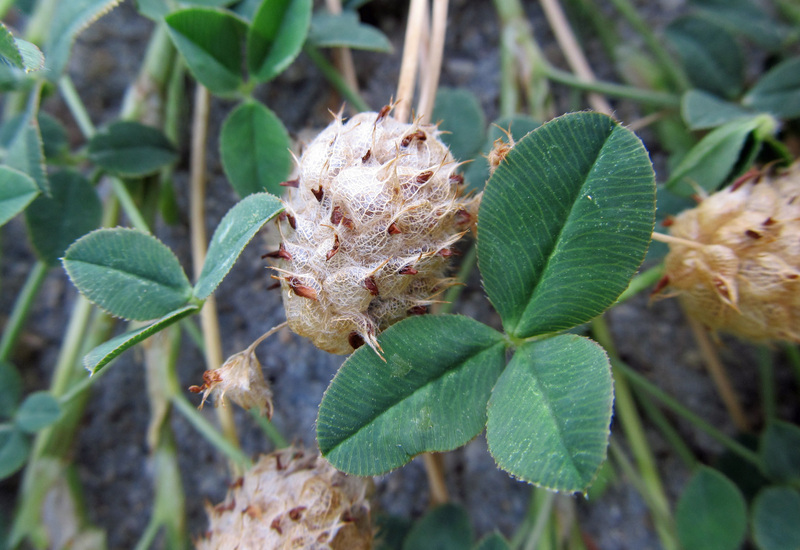 Closely related and similar looking strawberry clover, Trifolium fragiferum, is distinguished by its pink flowers and its fuzzy, rounded seed heads that resemble strawberries or raspberries. Red clover, T. pratense, grows more upright and taller than white and strawberry clovers and has red to purple flowers. Clovers are tough plants, tolerating heat, cold, drought, and trampling. Lawns deprived of water go brown fairly quickly, revealing green islands of interlopers, like clover, able to hang in there throughout dry spells. These days, many of us are reconsidering our need for a lawn. Lawns are water hogs that require a fair amount of inputs to keep them green and free of weeds, pests, and diseases. The excessive amounts of fertilizers and pesticides dumped on them from year to year is particularly troubling. Along with our reconsideration of the lawn has come clover’s return to popularity, and turfgrass seed mixes featuring clover are making a comeback. 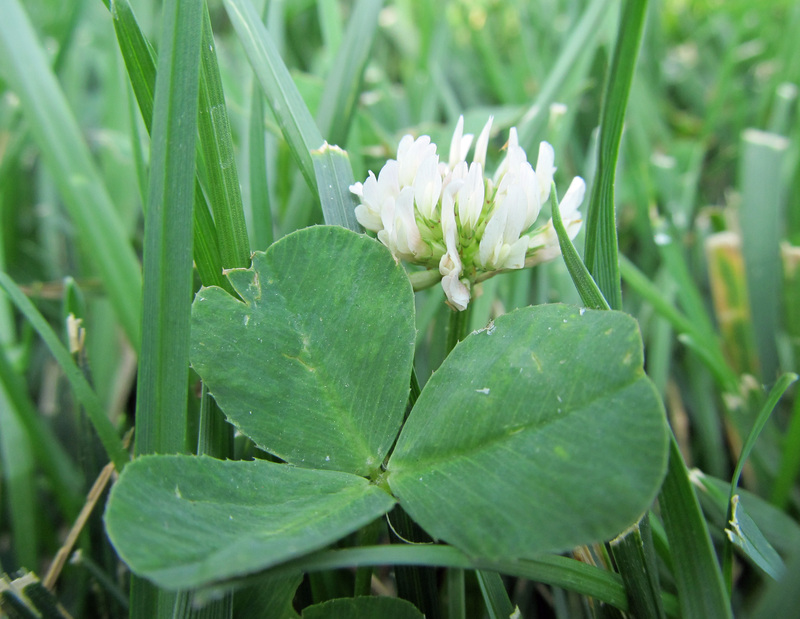 To keep clover around, herbicde use must be curbed, and so lawns may become havens for weeds once more. Luckily, many of those weeds, including clover, are edible, so urban foragers need only to step out their front door to find ingredients for their next meal. I tried strawberry clover leaves and flower heads in a soup made from a recipe found in the The Front Yard Forager by Melany Vorass Herrara. 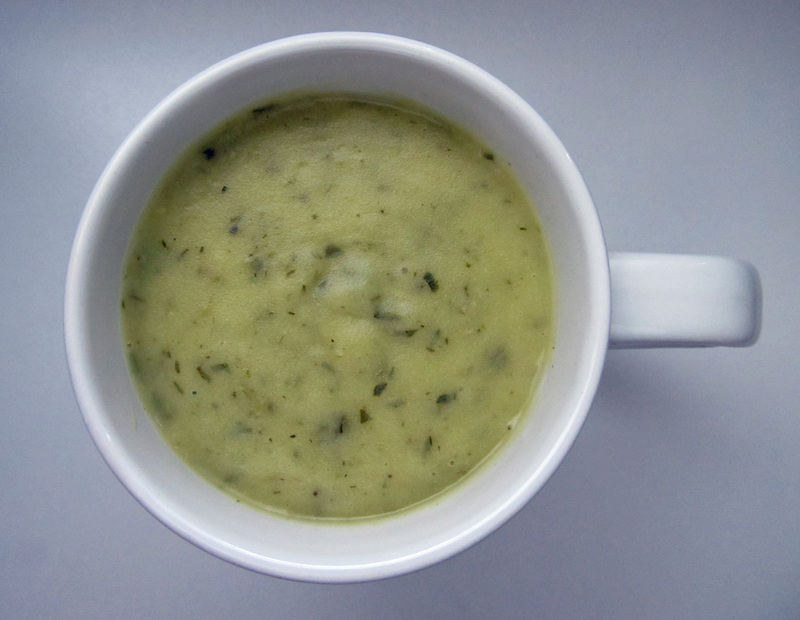 Around two cups of clover chopped, cooked, and blended with potatoes, scallions, and garlic in vegetable or chicken broth is a fine way to enjoy this plant. I don’t anticipate eating clover with great frequency, partly because it is included in a list of wild edible plants with toxic compounds in The North American Guide to Common Poisonous Plants and Mushrooms and also because I have to agree with the opinions of the authors quoted above – there are better tasting green things. Either way, it’s worth trying at least once. When you think of milkweed, you probably think of the life it supports. The monarch butterfly, for one. As the sole food source for its leaf-eating larvae, monarchs would be a thing of the past if milkweeds disappeared. Numerous other insects feed on its foliage as well, and there are a plethora of organisms that feed on its nectar, including bees, butterflies, beetles, wasps, and other insects, as well as hummingbirds. And speaking of birds, some birds use the silky hairs attached to the seeds to line their nests, while other birds strip stringy fibers from the stems for nest building. And while it is not a major food source for mammals, deer and other animals have been known to sample it. Indeed, milkweed is a veritable life force. But it’s also a poisonous plant. The latex sap of milkweed contains cardiac glycosides, among a variety of other toxic chemicals. The plant produces these chemicals to defend itself from herbivory, and so the insects that feed on it have adapted a variety of strategies to avoid being poisoned. Some bite a hole in a leaf vein and wait for the milky sap to drain before proceeding to eat the leaf. Others are able to consume the toxic foliage without being poisoned by it. Some even store the toxic chemicals in their bodies, making themselves poisonous to other organisms that dare consume them. 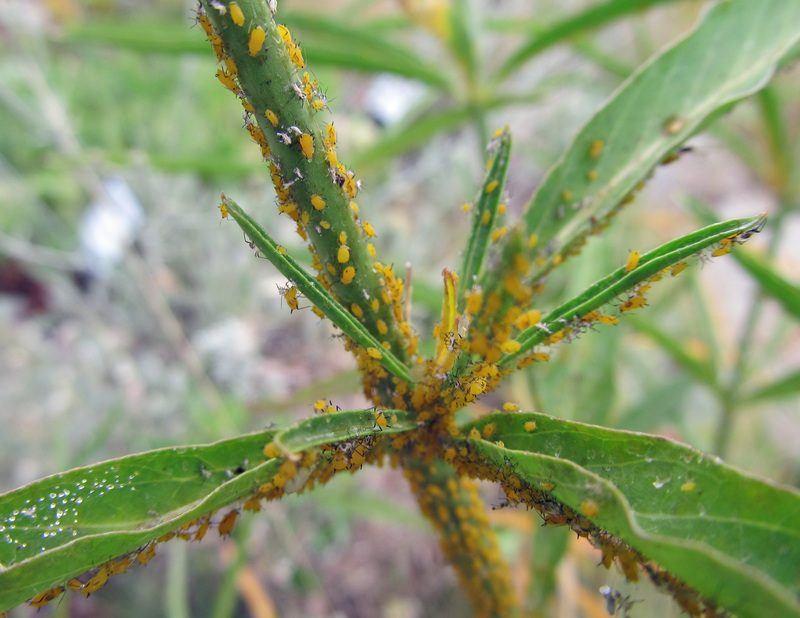 Aphids on Mexican whorled milkweed (Asclepias fascicularis). One species commonly found on milkweed is the oleander aphid (Aphis nerii), an introduced species that feeds on milkweeds and other plants in the dogbane family. While milkweed is generally found to be unpalatable to most livestock, those that venture to eat it risk being poisoned and even killed. A guide to milkweed written by the Xerces Society states, “sheep and goats are the most likely to be poisoned because they are browsers and often prefer to feed on weeds over other forages.” Weeds of the West calls Utah milkweed (Asclepias labriformis) “the most poisonous of all western milkweeds,” claiming that “as little as one ounce of green leaf material … can kill an adult sheep.” It also lists swamp milkweed (Asclepias incarnata) as “suspected of causing livestock deaths.” To make matters worse, dead and dried milkweed plants retain their toxicity, which is a problem when they end up in animal feed. 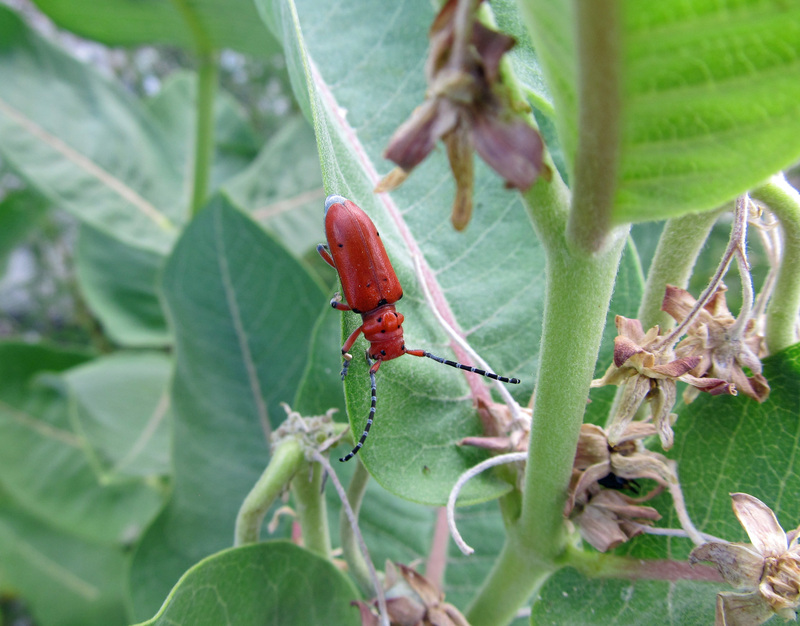 But milkweed’s toxic sap is not its only method for killing. In fact, it may not even be its most deadly. And this is where things get interesting. Last month I arrived at work one morning to find a portion of a dried-up milkweed inflorescence on my desk that had been left there by a friend and co-worker. Stuck to the inflorescence were three, dead, dried-up honey bees, their legs trapped in the slotted hoods of the flowers. Apparently this is a common occurrence; one that is mentioned in nearly every resource about milkweeds that I have read now, and yet I had never heard of it nor seen it until this gift was left for me. I then went out to a patch of milkweed to see this for myself. 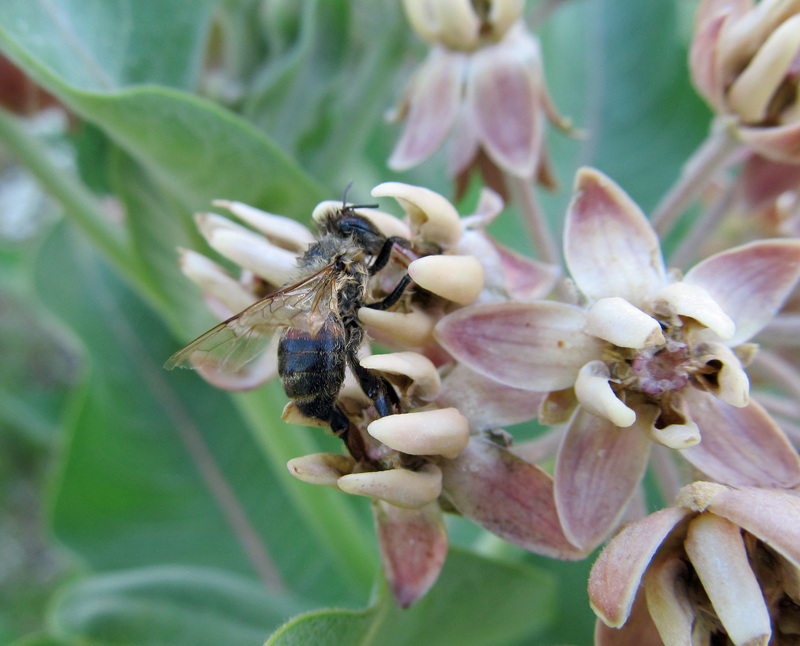 Sure enough, I found a few dead bees trapped in the flowers of showy milkweed. Milkweed flowers do not always give up their pollen sacs easily. The slits where the pollinia are found can, on occasion, trap the legs of visiting insects. John Eastman describes this in The Book of Field and Roadside, “insects sometimes become permanently wedged as the fissures trap their feet or the pollinia entangle them, and they die hanging from the flowers.” While milkweed species are native to North America, honey bees are not; they have not evolved alongside the flowers of milkweed, yet they are drawn in, like so many other insects, to the nutritious and abundant nectar. Honey bees were easily the most common victims observed in Robertson’s study, leading him to quip, “it seems that the flowers are better adapted to kill [honey bees] than to produce fruit through their aid.” And a honey bee’s trouble doesn’t always end when she escapes the grasp of the flowers. Pollinia and its connecting tissues can get so tangled around her legs and other body parts that she can no longer forage, subjecting herself to starvation and predation. To add insult to injury, dead and dying insects stuck to flowers result in another interesting phenomenon. Robertson writes, “many fall prey to predacious insects. I have seen them while still alive, attacked by ants, spiders and [predatory stink bugs].” Eastman adds daddy longlegs to the list of “scavengers” or “cleanup specialists” that come to feed on “flower trapped insects.” As it turns out, visiting the flowers of milkweed can be a dangerous, even deadly, game. Picking a favorite weed is challenging. If we dismiss entirely the idea that a person is not supposed to like weeds, the challenge is not that “favorite weeds” is an oxymoron; it is, instead, that it is impossibile to pick one weed among hundreds of weeds that is the most attractive, the most impressive, the most useful, the most forgiving, whatever. For me, salsify is a top contender. Salsify and goatsbeard are two of several common names for plants in the genus Tragopogon. At least three species in this genus have been introduced to North America from Europe and Asia. All are now common weeds, widespread across the continent. All have, at some point, been cultivated intentionally for their edible roots and leaves, but Tragopogon porrifolius – commonly known as oyster plant or purple salsify – may be the only one that is intentionally grown in gardens today. Its purple flowers make it easy to determine between the other two species, which have yellow flowers. As it turns out, I am not familiar with purple salsify. I don’t think it is as common in western North America as it is in other parts of the continent. In fact, the most common of the three in my corner of the world appears to be Tragopogon dubius, commonly known as western salsify. Tragopogon pratensis (meadow salsify) makes an appearance, but perhaps not as frequently. To complicate matters, hybridization is common in the genus, so it may be difficult to tell exactly what you are looking at. Regardless, salsify is a fairly easy weed to identify. It is a biennial (sometimes annual, sometimes perennial) plant that starts out as a rosette of gray-green leaves that are grass-like in appearance. Eventually a flower stalk emerges, adorned with more grass-like leaves, branching out to form around a half dozen flower heads. Salsify is in the aster family, in which flower heads typically consist of a tight grouping of disc and ray florets. In this case, only ray florets are produced. The florets are yellow or lemon-yellow, and each flower head sits atop a series of pointed bracts which encase the flower (and the forming seed head) when closed. Examining the length of the bracts is one way to tell T. dubius (bracts extend beyond the petals) from T. pratensis (bracts and petals are equal in length). 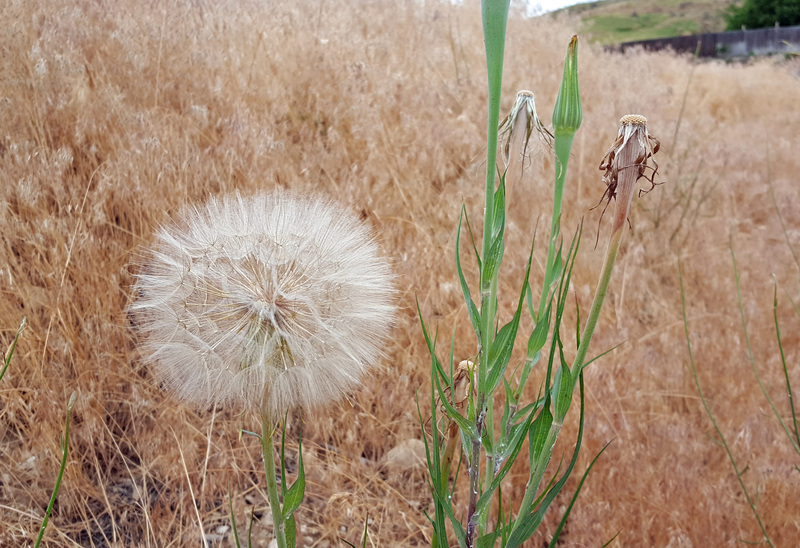 The seed heads of salsify look like over-sized dandelions. Each seed (a.k.a. achene) is equipped with a formidable pappus, and with the help of a gust of wind, seeds can be dispersed hundreds of feet from the parent plant. The seeds don’t remain viable for very long, but with each plant producing a few hundred seeds and dispersing them far and wide, it is not hard to see why salsify has staying power. 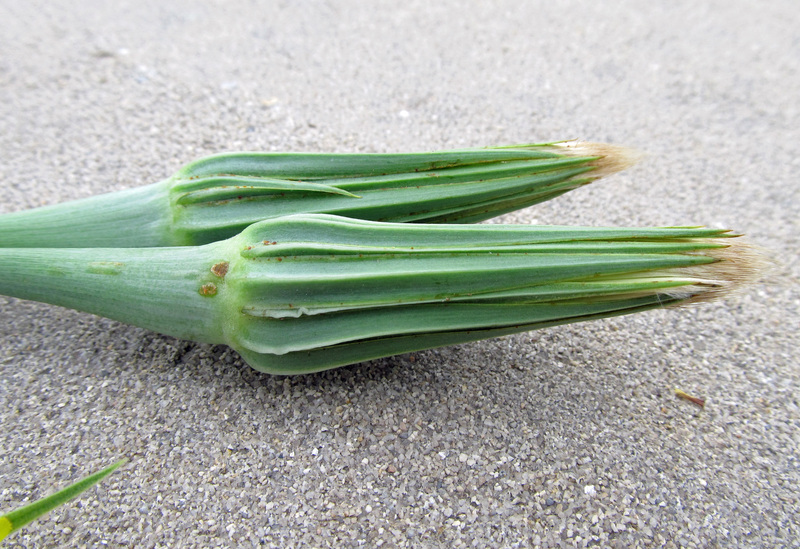 Open, sunny areas are preferred by salsify, but it can grow in a variety of conditions. 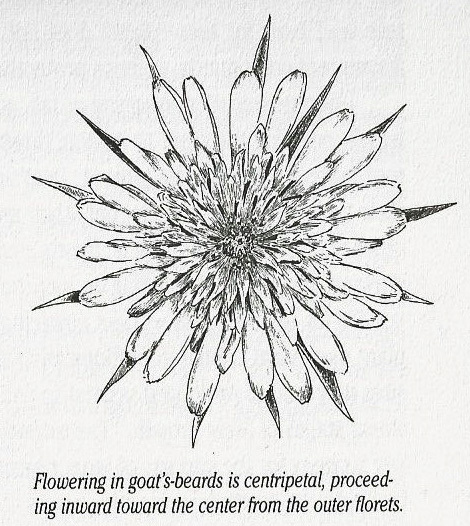 In The Book of Field and Roadside, John Eastman writes, “goatsbeards can establish themselves in bare soil, amid grasses and old-field vegetation, and in heavy ground litter; such adaptability permits them to thrive across a range of early plant successional stages.” Wild Urban Plants of the Northeast lists the following sites as “habitat prefrences” of meadow salsify: “abandoned grasslands, urban meadows, vacant lots, rubble dumps, and at the base of rock outcrops and stone walls.” While generally not considered a noxious weed, Tragopogon species are commonly encountered and widely naturalized. 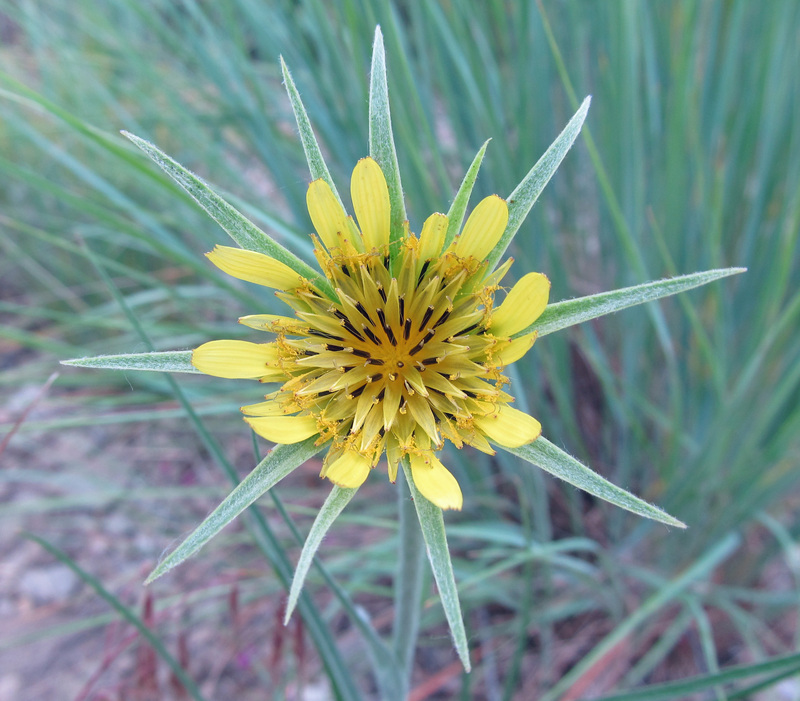 Last summer on a field trip to Mud Springs Ridge near Hells Canyon, salsify was one of only a small handful of introduced plants I observed looking right at home with the native flora. All that being said, why is salsify one of my favorite weeds? Its simple and elegant form appeals to me. Its gray- or blue-green stems and leaves together with its unique, yellow flowers are particularly attractive to me. And its giant, globe-shaped seed heads, which seem to glisten in the sun, captivate me. Its not a difficult weed to get rid off. It generally pulls out pretty easily, and it’s a satisfying feeling when you can get it by the root. It’s a sneaky weed, popping up full grown inside of another plant and towering above it, making you wonder how you could have missed such an intrusion. The roots are said to be the most palatable before the plant flowers, so if you can spot the young rosette – disguised as grass and also edible – consider yourself lucky. I haven’t tried them yet, but I will. [Editor’s note: Sierra tells me that I have eaten them in a salad she made, but at the time I didn’t know they were in there so I don’t remember what they tasted like.] If they are any good, that will be one more reason why salsify is one of my favorite weeds. Salsify is often called the vegetable oyster, because its roots are supposed to have an oyster-like flavor although I suspect nobody would be fooled. 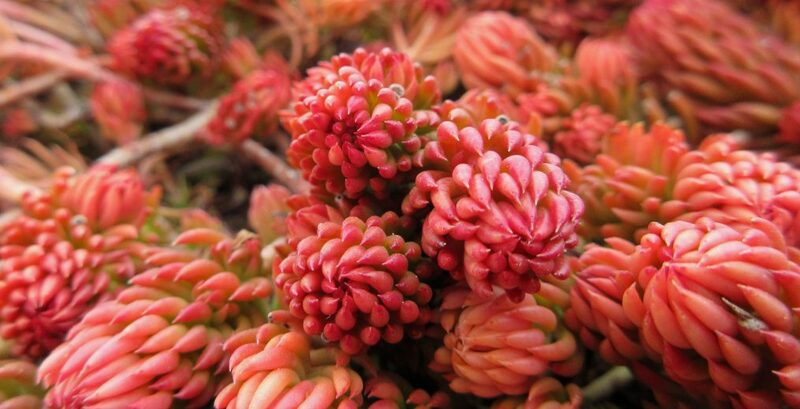 The long roots are pale and a bit like carrots – they are mild and sweet and when young can be eaten raw. Mature roots are better cooked. Traditionally a winter food, any roots left in the ground in spring will produce a flush of edible foliage.